[prMac.com] Jhangle Village, Taiwan - Ohanaware, a family team specializing in intuitive photo editing software, are very proud to announce the immediate release of their latest product, Fun Card Studio. Fun Card Studio is the more advanced version of Ohanaware's free e-card software, Fun Card Maker. It's been designed to provide more creativity with e-cards, while continuing to be easy to use. 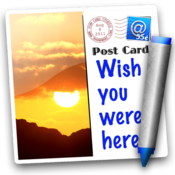 Fun Card Studio is Ohanaware's latest e-card (electronic postcard, like Apple iCards) software for Mac OS X. It's been designed to be quick and easy to use, while allowing a greater degree of customization and personalization. Fun Card Studio includes some unique features such as 1-Click Styles, built-in photo effects, stamp & postmark styles, send button to send Fun Cards via Apple Mail or Microsoft Outlook and iPhoto Exporting. Fun Card Studio is compatible with Mac OS X 10.7 (Lion) and feature Gesture support, use the trackpad to scale or rotate photos. Fun Card Studio is based upon Ohanaware's previous e-card software Fun Card Maker. Fun Card Studio requires an Intel powered Macintosh running Mac OS X 10.6.6 or newer. Fun Card Studio 1.0 is available from today via Apple's Mac App Store. Ohanaware is running a time limited special offer whereby Fun Card Studio can be purchased for $0.99 (USD), regular price is $9.99 (USD). Ohanaware is a husband and wife team living in the southern tip of Taiwan. Sharing a passion in Mac's and amateur Photography. Their first product 'Funtastic Photos' went on to win 4 star awards from both MacWorld and MacFormat. Their previous games company had a top ten hit with Recyclorama. Joy Sha has a history in the design industry with experience as a 2D and 3D artist, she also holds a masters in 3D animation. Sam Rowlands has been writing software since 1990 and is an award winning software developer. Copyright (C) 2011 Ohanaware Co., Ltd. All Rights Reserved. Apple, the Apple logo and Macintosh are registered trademarks of Apple Inc. in the U.S. and/or other countries.